This turned out pretty much the way I wanted it to. That doesn’t happen often. It was planned…but yet loose. I made myself put the color in loosely knowing that once the color was down, that was it, no going back in color. Just over drawn in graphite. I will try to do more of these, some in graphite some in ink. My goal is for the over drawing to simply have beautiful lines, even if that means changing what is in front of me. I am not exactly happy with the lower right corner, but the rest of it I am pleased with. 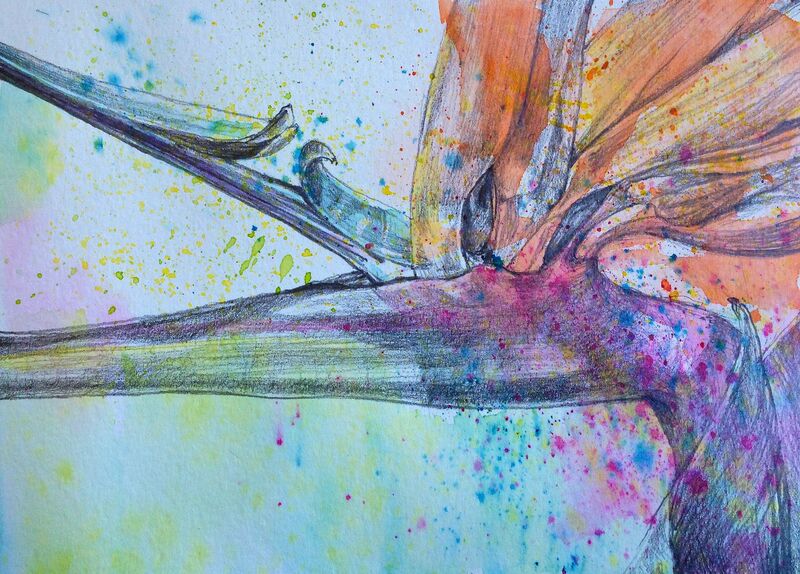 This entry was posted in Uncategorized and tagged bird of paradise, flower, graphite, Hawaii, small painting, water soluble crayon. Bookmark the permalink. I will look forward to seeing your approach Karen! It’s fun to do.